I think sometimes when starting out with a garden for the first time it can be a little intimidating. Even if you’ve done all the reading in the world, it’s a little hard to understand until you get out in the yard and give it a try. One of the easiest ways to make it less intimidating is to start out with the vegetables and fruits that are the easiest to grow! When I started my summer garden last year, I chose a few vegetables that I knew were easy to grow and that my family liked and went with those. There was surprisingly very little hands on activity, but seeing the plants growing in my yard every day made me feel really accomplished. 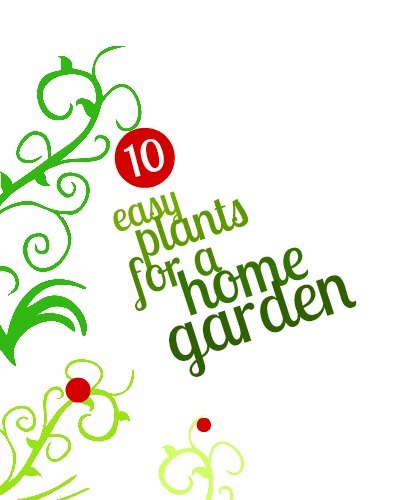 And if you’re not wanting to deal with seeds, lots of nurseries and home improvement stores will carry plants for the varieties that are more popular and easy, like tomatoes and peppers. The vegetables and fruits I’ve listed don’t require a ton of maintenance, love the summertime, and the harvest will be way tastier than anything you can get in a grocery store. Tomatoes. Tomatoes are one of the easiest to grow because they can basically grow in any sized space and can handle a little bit of neglect. You can grow them in containers, hanging baskets, pots, or your garden. Peppers. The peppers in my garden last year probably yielded the largest harvest out of all of my veggies. They like warm soil and are naturally pretty much pest free. Try starting with banana, cayenne, or bell peppers. Squash. Squashes like yellow and zucchini will sort of go crazy once you get them started, but make sure you pay attention to the instructions on your seed packet. They’re sort of particular about spacing. Cucumbers. Cucumbers enjoy lots of sunshine and moist soil. They can do well in large containers, too. Basil. If you’re wanting to start an herb garden, I’d say to start with basil. It grows pretty abundantly and it’s delicious in all sorts of foods. Tip: Basil can be a natural pest repellant to tomatoes. Plant it near your tomato plants to help keep bugs away. Mint. I love growing mint because it grows even if I forget about it. I planted some mint a couple of summers ago and it came back the next season without me even having to do anything. I’d suggest planting it in a pot or container; it spreads a lot so you wouldn’t want it to take over the other plants around it if it were in a garden. Radishes. Radishes are great in salads, but my favorite part about them is their maturation time: some of them mature in the ground in as little as 3 weeks after sowing. Peas. You can plant peas a little earlier than your other summer veggies. The young plants can tolerate a light frost. Strawberries. For some reason, I think strawberries are the most fun thing to find growing in the garden. They’re pretty and sweet and universally loved. You can plant them in your garden or in containers. Blueberries. It’s probably the easiest to start out growing blueberry bushes in a pot (they can get finicky about soil pH balance) rather than in the ground. Tip: I had trouble with birds eating my berries last summer. If you’re having that problem, try draping some netting over your plant. What are you favorite fruits or vegetables to grow?